Editor’s note: In most cases online payments are made through MyProcare. See: MyProcare Overview. The article below applies only to non-Cloud customers as an alternate method. How parents may register and use online services at TuitionExpress.com to make payments online, check their balance, sign up for email notifications, etc. Yes. All services are free to parents and guardians whose child care provider uses TuitionExpress.com. Some services, such as the ability to make online payments, or use a credit card, are at the discretion of your provider and may or may not be available. Do I need to complete an Authorization Form? If your child care provider will be collecting automatic payments from your bank account or credit card you must complete an authorization form available from your provider or you may Download a Payment Authorization Form and return it to your provider. If you are making online payments only (your child care provider will not be automatically collecting any payments) then no authorization form is needed. You’ll need two numbers to register the very first time at TuitionExpress.com. The first number is your unique Tuition Express ID number which will be given to you by your child care provider. If your provider will be collecting automatic payments you’ll need the last 4 digits of the bank account (or credit card number) from which you have agreed to pay your provider. If you are making online payments only (your child care provider will not be automatically collecting any payments) then you must GIVE YOUR PROVIDER the 4 DIGIT REGISTRATION NUMBER you want to use – just for the purpose of getting registered. Hint: This could be the last 4 digits of your phone or social security number, or any number that is easy for you to remember. You’ll register once to establish a user name and password you’ll use each time you log in to TuitionExpress.com. If you have previously registered enter your User Name and Password then click Log In. 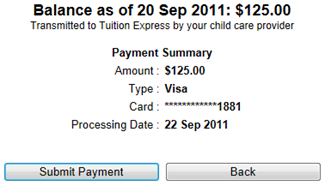 Then enter the Tuition Express ID number given to you by your child care provider. Enter your Registration Code. This is either the last 4 digits of the bank account or credit card number (used to make payments) or the 4 digit code you chose with your child care provider (see: Registration Number). Select a Username and Password. Then Confirm the Password and click Register. Hint: Forgot your username or password? Just re-register.Follow the on screen instructions to complete the process. If your child care provider allows online payments you may make a payment now or schedule one for the future. Log in to TuitionExpress.com and click Make a Payment (left side). Click either Use Credit Card or Use Bank Account. You may have one or both options depending on how you are set up with your child care provider. Click the Select a Card drop down list to choose an existing card or Enter a New Card. For a new card enter the information and click Save Card. If no cards have been set up you’ll automatically begin at the “new card” screen. Once the card has been selected enter a Payment Amount, choose a Requested Processing Date (lower right) and click Next. Confirm the amount, card being used and processing date then click Submit Payment (or Back to make changes). Enter a Payment Amount, choose a Requested Processing Date (lower right) and click Next. Confirm the amount, account type and processing date then click Submit Payment (or Back to make changes). To check the status of online payments and view a history of recent payments click Online Payment History (left side). Choose to receive email notifications from your child care provider if/when payments are automatically collected from your bank account or credit card. Click My Profile (left side). Enter or change your Email Address. Check the box to Receive Notifications and click Update. To print a report like a Payment Summary or Transaction Receipt click Reports(left side) and select a report from the drop down list. To see which credit cards and/or bank accounts have been set up for automatic payments (does not include parent initiated online payments) click Account History (left side).